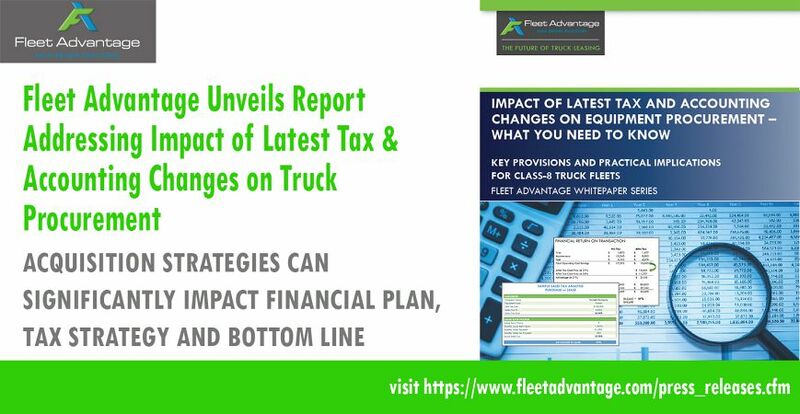 FORT LAUDERDALE, FL (May 8, 2018) – Fleet Advantage, a leading innovator in truck fleet business analytics, equipment financing, and lifecycle cost management announced today it has made public a new report titled: IMPACT OF LATEST TAX AND ACCOUNTING CHANGES ON EQUIPMENT PROCUREMENT – WHAT YOU NEED TO KNOW. The report illustrates key business provisions and practical implications of the updates and how they affect Class-8 truck procurement and the lease vs. buy decision. Entering 2018, private fleets and for-hire carriers have been forced to keep up with a robust economy, which has meant heavier transportation schedules due to increased online shopping and the transport of goods for other business customers. This healthy economy, combined with the recent changes approved to corporate taxes, means that investments in various types of equipment including trucks are expected to continue to grow. The start of 2018 has also introduced the dual challenge of requiring that finance leaders deciding whether to lease or buy equipment become familiar with the new lease accounting rules and provisions of the new tax laws as many of these issues are complex. It is important to analyze and understand how these changes may impact their acquisition strategy, balance sheet, financial plan, and tax strategy, and then adjust accordingly to help improve their financial performance. Click here to download Fleet Advantage’s latest report, IMPACT OF LATEST TAX AND ACCOUNTING CHANGES ON EQUIPMENT PROCUREMENT – WHAT YOU NEED TO KNOW. Fleet Advantage serves America’s top truck fleets and guarantees the absolute lowest cost of operation by providing truck leasing and matching proprietary data driven IT processes with fleet analytics using the latest eco-efficient clean diesel technology to achieve optimum vehicle productivity, while reducing operating costs. Fleet Advantage is ranked as one of the fastest-growing privately held companies in the state of Florida and the fastest growing independent truck lessor in the U.S. In 2018, Fleet Advantage was ranked as the 9th Top Private Independent from Monitor Daily; and in 2015 and 2013, the company was named to Inc. magazines’ 500|5000 list of fastest growing companies in the nation. In 2011, CEO John Flynn received the Ernst & Young Entrepreneur of the Year® 2011 Florida - Emerging Category award.